FUCheese » Goats in the city! Anna and Darlin’, her top milker. This summer I had a great time volunteering at the Madison High School City Repair project to build an outdoor classroom with a curving cob wall and a green roof. Anna Gordon was in charge of the site, working through the AmeriCorps program to teach kids and the community about organic gardening and sustainability. Behind Madison, there is now a sizeable fenced community garden and right in the middle is the outdoor classroom for people to take shelter, make plans, dream big and enjoy the fruits of their labor. It’s a really great project and it was so fun. If you ever get a chance to cob, do it — it’s amazing what people can accomplish with this material. Anyway, one of the days we were all working and talking and I discovered that Anna keeps goats! In the city! For milking! We had helped our friends Leah & Greg put up a chicken coop this summer so I knew that you are allowed up to 3 livestock animals inside the city limits. Beyond that, you need a special permit, which Anna’s household has. She is living on a double lot in Northeast Portland as part of a co-op of nearby households. There are 8 people who help oversee the goats and chickens and the garden. They take turns milking and cleaning out the pen and making sure that the goats are healthy and thriving. Darlin’, Cheyenne and baby Mona are very happy goats. This past summer, both Cheyenne and Darlin’ had a few kids (the name for baby goats). The girl, Mona, is staying with them until she is weaned. 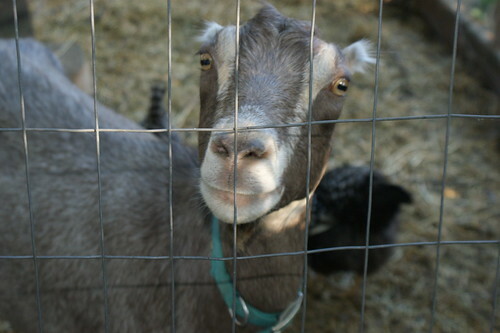 When Mona is ready she’ll go off to a new family to be their milker — a tough decision for a goat keeper! Mona was acting just like a toddler, jumping around, tugging on Anna’s shirt hem for attention and just being a little rascal with the other goats. At some point during the last year, Darlin’ was attacked and injured by a dog who had to jump two fences to get at the goats! They nursed her back to full health and are trying to figure out what can be done about that. So far, the culprit has not been found. The chickens seems really happy to hang out with the goats and apparently they are really great egg layers. Anna and the co-op members all play with turning the goats milk into cheese. Her twin sister, Nori, did six months in Italy on a goat dairy farm so she definitely knows the ropes. Back when we were working on the cob project, I remember her saying that these are the most pampered goats she’s ever worked with. I bet! Only miniature goats are allowed within the city limits and these goats are miniature Lamancha goats. Just like the Lamancha goats we visited last year when we got our goat milk, these guys are super friendly and sweet and very curious. Anna was very gracious and sent me home with a quart of fresh goat milk — feta, do you think? For more info about livestock in the city of Portland you can contact the Multnomah County Environmental Health Services Department. 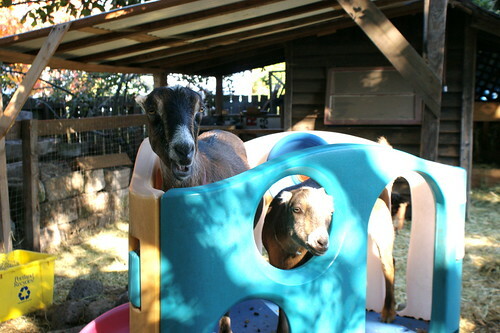 I also really liked all the information available at the awesomely named Goat Justice League website based in Seattle which gives you the basics on how to keep goats healthy and happy in the city. Lastly, the Urban Farm Store seems to be a nexus of information and classes about urban livestock — from ducks and chickens to bees to composting and gardening. Check them out! I love that there are so many people right now interested in these sorts of things. I don’t know if it’s a reaction to our service economy or if it’s just a strong desire to know how things work and why but I can’t help but think it’s a good thing. I think every generation kind of tries to make sense of their world and that manifests in a different way. We are both privileged to live in such an easy time and deprived by being so removed from our food sources and the essence of what makes our lives possible. And we’re also a weird generation who seems to be reacting to the extreme commodification of everything by saying, “I don’t like that. I’ll do it myself.” From my point of view, there is a lot of simple satisfaction and joy in exploring these things. What I like most about cheese is that it’s so much fun – it’s science, it’s seasons, it’s animals, it’s people and everything comes together in a tasty little package that becomes sublime when shared with friends alongside beer and wine. Am I right? 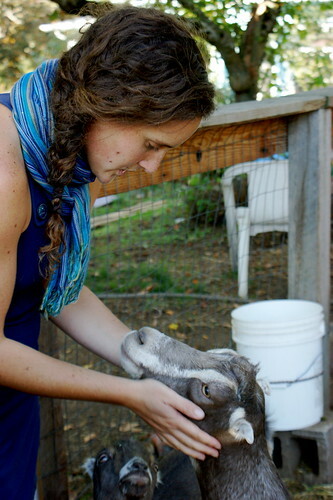 You can see more photos of Anna and the goats on my Flickr stream. UPDATE 11.20.2009! The Oregonian did a story today on Anna’s cohousing group. Check it out!